I am back home in Australia with my wife, and we were recently on a road trip with my parents. We passed through Sovereign Hill, an 1850's themed town - technically a living museum of life in Ballarat, Victoria during the Victorian gold rush. I found Sovereign Hill fascinating, because it gives an insight into 19th century Australian life, and I'm sharing it here because it shares a lot of similarity with 19th century American life; we were both countries pushing to settle the frontier, made up of mostly immigrants looking for a better life in the new world. Sovereign Hill, as well as much of Australia during that period, feels very similar to the American Old West. A look down Sovereign Hill's Main Street. There is even a "United States Hotel." Visitors can pan for gold in the stream. What I really loved about Sovereign Hill is that it felt alive. The buildings felt functional - they were not mere facades. If there was a building or a workshop, you could enter it and watch the townsfolk work. The founder at work building a handle. The same gentleman bending a flat plate of iron into the shape of a wok. His wares for sale. $30 for an iron frying pan you can watch him make isn't bad. I think Sovereign Hill is interesting from an urbanist perspective because it gives an interesting insight into what our towns we live in today evolved from. Just from walking around, it felt like all of the pieces of a fully functioning town were there. A fine-dining restaurant of the era. A baker at work in the bakery. The equipment used by the local fire brigade back in the day. There was even a functioning theatre with live shows. Today, we like to separate manufacturing from our cities - placing manufacturing in dedicated industrial zones, isolated from the rest of town. However, walking around Sovereign Hill, it was easy to notice that most of the buildings were workshops - it is hard to imagine the town being only retail and residential. Where would the people work? A man building the spokes for a wheel at a 'wheelery'. One of the carriages they had built. You could actually go for a ride on the carriage. Men tending a backyard vegetable patch. I'm not sure if they were supposed to be here because they weren't wearing period clothing. You could watch gold being melted down and poured into an ingot. A room tightly packed with school kids watching the confectionist at work. This would have been a fire hazard back in the United States. The boilers powered most of the machinery in the town. 1850s technology at its finest. No town is complete without homes. A typical house. They don't seem very comfortable by today's standards. One of the nicer houses. The nice house had a good view of the town below. Not everyone was privileged to a house. Many of the immigrants early on were poor and lived in camp sites near the gold mines. It is interesting to see how the early streets were configured. Because they did not have cars in the 1850s, the town was built for walking. Sidewalks and curbs serve a different purpose here than we see in contemporary towns. A residential street shared by both people and horses. Notice how there is no sidewalk - just one flat surface for everyone to share. There is a ditch for waste water on the left. A precursor to the curb? Most buildings (including houses) had some kind of porch. Was it to wipe your shoes and keep mud and dust outside? These two commercial buildings are side by side and share a porch. On this street lined with buildings, all of the porches are linked together, forming something that represents a modern sidewalk. Its purpose is not to segregate traffic though, since other than the odd horse the only traffic was people! Many of the buildings had drains that ran out into the street. It looks very similar to a modern curb. A street with paved drains, but no sidewalks. Sidewalks wouldn't have a served a purpose anyway since there was nothing to segregate. An alley between cottages. An easy way for the residents of the upper streets to get down to the shops below. 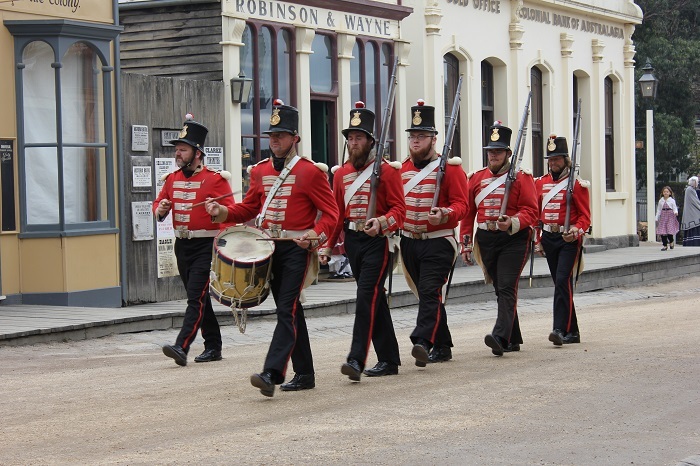 Visiting Sovereign Hill was a really fun experience. Not only can you be mesmerized by workers going about their crafts in their workshops, go down into a real gold mine, and learn about the history of the region, but you also get a glimpse of life and how our towns were like a century and a half ago. A lookout over Sovereign Hill.